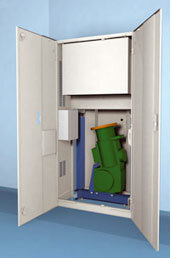 The lifts designed in compliance with the CABIFIT model are characterized by the machinery (gearbox, control panel, panel with main and lighting switches) contained in a cabinet. A very wide range of solutions, with various loads, dimensions, and car finishes, landing and car doors type and dimensions, is available. The machinery occupies an area of less than 0.4 m2 (width 950 mm, depth 400 mm), instead of about 4 m2 for the traditional machine room. The cabinet height is 2 metres, that is the minimum height for the area where maintenance operations are carried out, and it can be located at any landing. The cabinet dimensions are always the same, regardless of the installation features (capacity, speed and number of stops). Gearbox and control panel components are very close together. This makes assembling, maintenance and rescue procedures easy. Most of the lift load rests on the car and counterweight guides. Load bearing beams to fix onto the shaft walls are not required. As for ELEKTROFIT models, owing to the frequency control system, provided by a high quality inverter, a high standard of ride comfort, reduced current consumption peaks and consequent energy and money saving, reduced mechanical stresses and reduced temperature of the gear motor are obtained.